There's more to trucking than the act of simply getting behind the wheel. Many drivers there's a rich culture and history of the industry to explore. Even the most experienced veterans of the road can brush up on their knowledge of the world of truck driving or learn something new about the field they operate within. Take a look at stories of infamous drivers, hot topics centered around the road, or learn about some of the great careers that commercial driving has to offer. Trucking Companies Hiring is here to help drivers stay informed and up to date with vital knowledge for your everyday life chasing that long white line. In today's landscape of trucking, the term "intermodal" has been more visible than ever, leaving some drivers curious as to how this chain of delivery impacts their particular industry. 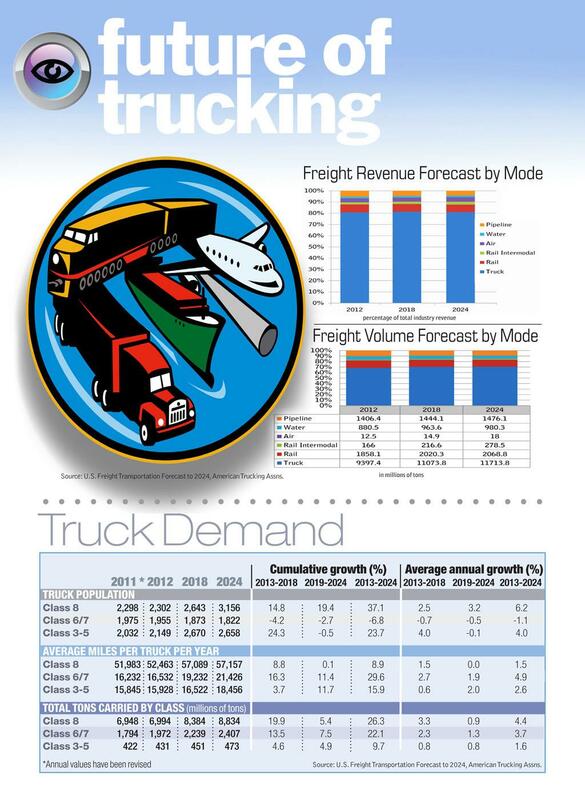 While the average load-to-truck ratio in April was 3.5 for vans and 6.6 for reefers, the flatbed load-to-truck ratio was 43.7 loads per truck! That's the highest monthly load-truck-ratio we've seen in years. Truckers Against Trafficking explains that using terms such as "lot lizards" can be detrimental to fighting the issue of human trafficking and can be demeaning to those who are victims of the trafficking trade. Before truckers had phones, tablets, computers, or any sort of digital landscape to access, many truckers relied upon freight brokers in order to find a load in order to get paid to haul it. The process of finding freight (which is still somewhat prevalent today) was incredibly arduous and time-consuming, often leaving truckers who were not company drivers or those who were not assigned freight in their trucking job in the dust. To this point, many drivers report an annual salary that sees an average of $63,668. With an impressive starting base, many drivers are enticed to join the ranks of UPS in hopes of moving up the ladder and seeing the potential for even more pay every year. The leading job board for drivers across the country who are ready to find companies that offer the most to the drivers they bring on to their fleets. TruckDrivingJobs.com provides drivers with more than just trucking job openings, it gives individuals a full scope of job resources. Job seekers know TruckDrivingJobs.com as the destination for the most comprehensive array of opportunities that always benefit the driver. Join the fastest growing community of truck drivers who come together to meet, share their experiences and help one another. Have a question? Come on in! For over 42 years the Owner-Operator Independent Drivers Association has been fighting for the rights of all professional truckers. We are proud of our history of effective representation, and as we grow, we will continue to fight for our members' best interests in new and more powerful ways. You are one step away from pursuing a career as a truck driver. All that's left for you to do is to pass the Commercial Driver's License Test at your local DMV and a CDL can be yours. Before you can do that, however, you need to prepare for the test! Luckily, Express CDL School is here to help. Many truckers and fans of truckers alike know about ice road truckers, both as a division of professional drivers and the popular History channel program, which is still airing at this time of writing. Since Gorsuch's nomination, a former truck driver, Alphonse Maddin, has come out to speak against Gorsuch, as he feels it was Gorsuch's fault Maddin was wrongly fired from his trucking job in 2009. Frederick McKinley Jones (May 17, 1893 – February 21, 1961) was an African-American inventor, entrepreneur, winner of the National Medal of Technology, and inductee of the National Inventors Hall of Fame. His innovations in refrigeration brought great improvement to the long-haul transportation of perishable goods. Good article regarding the case with Keith Hunter Jesperson, who soon became known by the villainous name of the "Happy Face Killer." Thankfully, Jesperson has been put behind bars for his murderous crimes – but many will not soon forget the long-haul trucker. In 1994 Rhoades was convicted of the first-degree murder of Regina Kay Walters and got a sentence to life without parole at Menard Correctional Center in Illinois. In 2005 Rhoades was tried for the deaths of Walsh and Zyskowski, ultimately resulting in a life sentence in Texas as well. It is safe to say that Sutcliffe grew up in a home and environment that was thoroughly working-class. Like many drivers in the world who later took on a trucking job, Sutcliffe worked a series of manual labor positions ranging from menial positions to a few gravedigger positions. Joshua Giesbrecht has made a name for himself by giving others a literal look inside the routine of the modern day truck driver. While Giesbrecht certainly isn't the first to bring public awareness to the profession or to help those outside the industry better understand who truckers are, his series of video logs – vlogs – have let many see some personality within the cab. Allie Knight is no ordinary driver within the trucking industry. With a legion of fans following her through social media and a heavily-viewed YouTube channel documenting her life on the road, Knight has cultivated a presence that is more than just a vlogger with a truck driving job, she has become a prominent figure for a younger generation on the road. Lady Jamileh Kharrazi is building a better world by disseminating the impact of arts as a meeting ground for all cultures. She is working with diverse communities to improve quality of life in war trodden nations while empowering women and creating educational opportunities for children. Get inspired by the industry around you and let us act as your second seat while you navigate through the exciting and interesting tales from the road. Get the lowdown on the possibilities in commercial that can boost your profession into the stratosphere and see what others have done in their own line of work to become true kings of the road. Drivers know how important they are to the flow of American life as we know it, and that is why we have dedicated resources to those who make a difference in the everyday lives of those in our nation. Don't let your career in driving pass you by. Stay ahead of the curve and educate yourself with some of the most intriguing and important subjects surrounding trucking. We are here to help you learn about the fascinating and sometimes strange background within the realm of driving as well as excellent career opportunities one may not have previously considered. Enjoy the enlightenment TCH provides to those who are ready to learn. Truck drivers can learn about the feats, misfires and trials and tribulations that drivers before them have faced throughout the history of driving in both America and in the global scene. By studying the cases listed on our site, readers can find out about others who have gone over the road, drivers can see both the positive and somewhat mysterious side of the industry and see what makes an operator a notable figure, for better or worse. Some of these success stories featured from individuals may have stemmed from one using online resources like ours, seeing how using modern technology to spread awareness or entertainment throughout the world can truly make a change. We promotes the stories of movers and shakers in trucking as well as those who can prove to serve as a powerful example. We aim to show drivers some of the top salaries in their field from some of the most prestigious and well-known companies across the country. Visitors to the site can get an idea of what salaries and benefits are truly considered competitive, and how they might position themselves to be a notable potential applicant for these positions. Through studying what makes a well-revered company infamous, drivers can learn how to strike up their own brand of infamy and become recognized for their expertise. More importantly, we have open positions in the lower 48 that drivers are searching for. By utilizing our channel of resources, drivers have the ability to apply for jobs through TruckingCompaniesHiring.com and find that immediate opening in order to find a run as soon as possible so that their line of work is not just an income, but a greatly prosperous career. Drivers who visit our site don't let paths to jobs pass them by, they seize the opportunity and find excellent trucking companies to work alongside. It's no secret that knowledge is one of the most valuable tools that a driver can possess. The more information that one discovers about commercial trucking and trucking jobs, the more prepared they will be to advance within their driving positions and find the tools available to them. Drivers can stop endlessly searching around the web for verified and expert materials that fall in line with making their life in driving a more fruitful one. TruckingCompaniesHiring.com has everything a driver might need with the support of industry experts, fellow road warriors and companies that are recruiting that want to accomplish one ultimate goal – triumph for American truckers.